Baseball, our national pastime. All fans have great memories of their teams. We also remember those things that we wish we could forget: the errors, the mental mistakes . . . and the ugly uniforms. 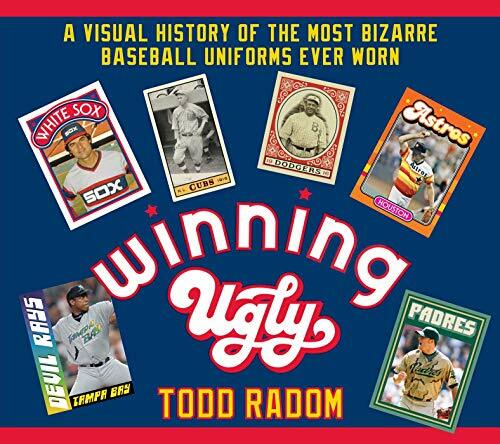 In an ode to those eyesores, Todd Radom has collected and chronicled some of the swing-and-misses we’ve seen on the baseball diamond. Remember when the Chicago White Sox thought wearing shorts in 1977 was a good idea? How about when the Baltimore Orioles wore their all-orange jerseys in 1971? Do you remember the 1999 “Turn Ahead the Clock” campaign? Or the most recent all-camo jerseys of the San Diego Padres? Yes, there is much to talk about when it comes to the odd uniform decisions teams have made over the years. But just like there’s love out there for French bulldogs or Christmas sweaters, ugly uniforms hold a warm place in the heart of all baseball fans, and Winning Ugly is just that: an ode to our favorites from today and yesterday that bring smiles and sighs to all baseball fans. Sure they didn’t affect wins and losses (unless you mention Chris Sale), but a fan’s love and ire goes well beyond the current standings. So whether your team appears in Winning Ugly or not, fans of the sport will enjoy reliving the moments most teams would like to forget.